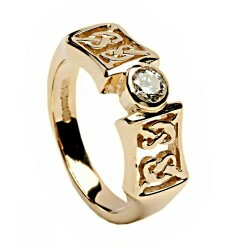 A beautiful Irish made Ring featuring Celtic Knots made in 14 Karat Gold, also features a 0.5 Carat ..
A beautiful Yellow Gold Ring, made in Ireland, featuring a White Gold Trinity Knot made in 14 Karat .. This is one of our favourite rings -the elegance of the simple lines is understated and pure. The kn.. The River Boyne has been an important part of Irish History for thousands of years. It is overlooked by the Hill of Tara which was the seat of the ancient High Kings. It was the place where the "Salmon of Knowledge" was captured and imparted its wisdom to Fionn MacCumhaill. This collection was inspired by the surface ripples and hidden depths of the ancient river.